Are you a LEED AP? If so, there is still time to add a specialty to your LEED credential at the USGBC’s annual Greenbuild conference even if your enrollment deadline has passed. The majority of LEED Professionals have already added a specialty to their LEED credential but the window is closing. The specialty credentials can be added to your LEED AP by simply logging onto your GBCI account and clicking enroll or by visiting the LEED Credential booths at Greenbuild located on level 600. After that, you have two years to maintain your credential by following prescriptive credential maintenance, completing 30 hours of continuing education activities over a two-year period. Prescriptive credential maintenance is on a one time activity that maps your specialty over to the newest version of the LEED rating system. After the prescriptive maintenance is complete, LEED APs with specialty will maintain their credential in following years through a variety of methods such as taking courses or working on LEED projects. There is no risk and no fee to enrolling in a specialty through prescriptive credential maintenance. LEED APs can also choose to forgo prescriptive CMP and add a specialty to their credential by taking the specialty portion of the new LEED AP exam, at a cost of $150- $250. Greenbuild also offers an array of hour-earning opportunities, from education sessions and workshops to speaking events and green building tours. Over 170 courses have been approved for credential maintenance credit—and hours earned at Greenbuild are automatically reported to GBCI, making it easier to track your maintenance. The specialty credentials ensure that LEED Professionals stay current with green building innovation, standards and practices through the Credential Maintenance Program (CMP). CMP, which requires LEED APs with specialty to complete 30 hours of continuing education every two years, also allows LEED Professionals to grow their knowledge base and show clients and employers that their expertise remains meaningful in a continually transforming marketplace. Employers and clients are increasingly seeking LEED APs with specialty. This trend will popularize exponentially as LEED 2012, which awards an Innovation point to project teams featuring a LEED AP with specialty, nears release. Additionally, all candidates for the LEED Fellow distinction, honoring the green building industry’s most accomplished practitioners, must hold a LEED AP with specialty credential. Credential maintenance for LEED APs with specialty is easy; you can earn 10 continuing education hours simply by working on LEED projects—a daily activity for many LEED Professionals¬—and five hours through self-study, including reading the LEED Reference Guides and reference standards. That’s half of your hours every two years, and with the new GBCI Course Catalog and USGBC Webinar Subscription, finding your other 15 hours is a breeze. With so many advantages to enrollment, why not add a specialty to your LEED AP credential in Toronto? It’s just another way to benefit from Greenbuild’s expansive offerings. See you there! Stop by the Center for Green Schools display at Greenbuild and you just might learn something! The Center for Green Schools at USGBC has been busy preparing for this year’s Greenbuild International Conference & Expo taking place next week at Metro Toronto Convention Centre, and we encourage everyone to stop by the Center for Green Schools and USGBC Students display area located on the 700 Level of the South Building. Center staff will be holding “office hours” and other special events, so visitors can take a break between sessions to sit, relax and learn more about the many programs and initiatives targeted at greening K-12 schools, colleges and universities. Here are 11 Center events during Greenbuild you definitely shouldn’t miss! With today’s announcement from Secretary Arne Duncan, the Department of Education has finalized the criteria for the Green Ribbon Schools program and is inviting schools to participate in this landmark initiative. This program is truly the biggest thing to happen to the green schools movement, and the opening of this voluntary recognition program creates a new center of gravity for the many organizations, associations, coalitions and individuals working to advance and the Center’s mission to put every child in a green school within this generation. I strongly encourage all local schools to visit the Department of Education’s Green Ribbon Schools website to review the criteria, which is divided into three pillars – (1) healthy learning environments, (2) environmental impact and energy efficiency and (3) environmental literacy – and work with their state education authority to submit their application. The speed and efficiency with which the Department of Education has been able to develop and launch this program, collaborating closely with EPA and other federal agencies, is incredibly noteworthy, and shows that there is a clear national priority for green schools. Further, when this initiative is considered alongside the implications for green schools currently contained within the American Jobs Act, it’s clear the green schools movement has reached a tipping point. Since the announcement to launch this program last April, we’ve been proud to express our excitement around this initiative and work collaboratively with leaders from the public sector and NGO community to promote the success of this program. This is a proud moment for everyone working to advance the green schools movement, but I’d to personally congratulate our friend Jim Elder, Director of the Campaign for Environmental Literacy, who originally conceived the idea for this program and has worked tirelessly to build a nationwide network of make Green Ribbon Schools a reality. If you’ve followed the development of the International Green Construction Code, you’d know that the code’s coverage of low-rise residential buildings has been knocked around like a punching bag. First it was in. But since it was incorporated by reference and the development committee couldn’t touch it, the residential content meshed neither with the new code’s intent nor with its technical elements. Then it was pulled out. Then, most recently, it was not voted back in… and with this current, last round of opportunity, there’s one final chance to put it back in, and do it right. For state and local governments that are looking for a code to provide oversight of minimum greener building measures and practices in their jurisdiction, it’s been a shame not to have an answer for low-rise residential. Neither the IGCC nor the Standard 189.1 compliance alternative covers these residential occupancies. Certainly our current environmental, economic and human health challenges demand that we provide such an answer for jurisdictions that want to extend the benefits of healthier, safer and more efficient buildings to the structures where we live, sleep and play. If you’ve ever toured the Solar Decathlon – especially this year with its emphasis on affordability – you might even better appreciate that we deserve more from our homes. A study released earlier this month reveals that buildings built to a building energy code saved energy (and thus money) compared to homes not built to such codes. This may come as no surprise, but it’s important validation that codes can do a good job of delivering minimum performance. Codes may never be the silver bullet approach to achieving truly sustainable buildings, but we do need them to keep pushing us all along (watch the webinar). This need for code-intended guidance to govern greener low-rise residential buildings is a product of a a growing comfort with raising floor for minimum acceptable practice. Much like the history of greener commercial building codes, local governments have been pioneering home-grown programs and adopting rating tools like LEED for Homes, and are now increasingly looking for a code that will give them ownership and oversight over better, greener residential buildings. Some point to the National Green Building Standard (NGBS), but it’s a rating system, and not written for use as a mandatory, minimum code (even though it also carries a code-like nick-name, ICC-700). LEED for Homes demands a far more substantial minimum entry point beyond business-as-usual, but rating systems do not a useful, enforceable code make (see the USGBC policy brief). Despite the way it may have appeared, the recent decisions at the IGCC hearings in May to disapprove proposals to reinsert residential into the scope of the code were not a vote against including low-rise residential in the IGCC. They were merely votes against a few proposals that were not perfect for inclusion as written. Clearly a new approach was needed. After the hearings, I worked with the Green Builder Coalition and Chris Mathis (of Mathis Consulting Company) to convene a group of experts to devise a new plan. The comments we submitted were made public last week on the Council’s IGCC development web site (our comments are on pages 43-49, but be careful, it’s 1200+ pages). I’ve extracted the comments here. We proposed that a short chapter be added to the code that would pull a handful of commonly-agreed-upon practices across all category areas from the existing language of the IGCC. These 20 items – a refreshing number contrasted with the code’s nearly 250 pages of code language for commercial buildings – can provide a reasonable and significant push for residential buildings. It’s two comments, really. One to make the chapter elective to the adopting jurisdiction (more palatable to some), and one to include it in the core text of the code (preferred). What do you think? I hope you’ll join us in Phoenix on November 2nd to fix this major shortcoming of the IGCC with a smart, compact, and remarkably significant solution. No power on Earth can stop an idea whose time has come. You don't have time to be starstruck. Yet we are struck, not by a performance in front of the camera but by the dedication to a cause (like Petra Nemcova whose organization Happy Hearts Fund has rebuilt 55 schools in communities devastated by disaster). And you don't have time to be handcuffed by the overwhelming statistics that dominate the challenges we face, but instead we are set free by the power of ideas and the collaboration needed to solve those problems. It's where you come to learn (or be reminded) that all you need is something we've always had – the power to act. In fact, when you walk through the doors of the Clinton Global Initiative – President Clinton's annual meeting to build a better world - it's like you've landed on another planet where as a rule barriers are dissolved, opportunities are seized, and cooperation is prized. Seven years ago, President Clinton captured lightning in a bottle. He created an event that inspires action and harnesses commitment. It's why Judith Rodin, the president of Rockefeller Foundation said at a previous CGI meeting, "Partnership is the new leadership," and why Governor Hickenlooper (Colo.) said, "Collaboration is the new competition." It's our clumsy way of describing how President Clinton and his Clinton Global Initiative have transformed how we work together to change the world and turn ideas into action. On Wednesday, President Obama put it simply: "CGI was an idea whose time had come." And now that idea, this remarkable event, has helped hundreds of millions of lives in 200 countries around the world. For me, this is the same place four years ago where a side conversation with Brad Pitt, President Clinton, Tom Darden and Bill McDonough about rebuilding a neighborhood in the 9th Ward led to the creation of Make It Right and what is now the highest concentration of LEED Platinum homes in the world. But this isn't just the marketplace for collaboration and ideas. It's the marketplace for execution. And it has been amazing to see the tremendous focus on green building grow over the years. It truly is a testament to President Clinton, who is showing the world that green building is an idea whose time has come. Anywhere you go, the story is the same: green buildings save energy, save people money and fuel job creation. And I was honored when President Clinton asked me last year to chair CGI's Scaling Sustainable Building Action Network to further cultivate CGI commitments in this space. Apparently, he's been asking a lot of people to get involved. And we know President Clinton has friends in high places. Here's what one of his friends said during this year's conference: "Earlier this year, I announced a Better Buildings Initiative to rehire construction workers to make our buildings more energy efficient," said President Obama on Wednesday at CGI. "And I asked President Clinton and my Jobs Council to challenge private companies to join us. In June, at CGI America, we announced a commitment to upgrade 300 million square feet of space, from military housing to college campuses. Some of these projects are breaking ground this month, putting people to work right now. Later this year, we'll announce more commitments that will create jobs, while saving billions for businesses on energy bills and cutting down on our pollution." How amazing – President Clinton and President Obama teaming up to accelerate green building! A commitment by OVG, a Dutch real estate firm, to create the Global Climate Change Real Estate Fund, a billion dollar fund to support the development of sustainable buildings. A commitment by NRDC, in partnership with Johnson Controls Inc., Jones Lang LaSalle, and Goldman Sachs, to create a three-year project to grow demand for green buildouts in commercial tenant spaces. A commitment by the AFL-CIO and the American Federation of Teachers (AFT), in collaboration with CGI and Center for American Progress (CAP), to work with fund managers to re-invest up to $10 billion in pension assets of working families into energy efficient infrastructure and energy efficient buildings as an opportunity to create hundreds of thousands of jobs for Americans, develop new industries in the United States, enhance our country's global competitiveness and reduce global warming pollution. A commitment by AEG to build the first carbon neutral stadium, Farmers Field, a 72,000-seat, downtown Los Angeles football stadium and event center. And we incubated several other ideas, like a Green Schools Fund, a Guide for Green Stadiums, a Governors' Roundtable on Resiliency, and the list goes on. These commitments are simple but profound things. They embody our will to act, our ability to do good. And each commitment takes us closer to the goal of a better world, and, as President Clinton says, "gives us hope for our shared future." One of our commitments this year – something that gives me hope for the future – is Project Haiti. Two years ago, President Clinton invited me to travel with him on a mission to Haiti to see how the country was grappling with various economic challenges. Despite some of the country's pressing problems, the people were happy, welcoming and warm. And I was touched by their spirit – resilient and generous. Less than a year after that trip, Haiti was hit by the catastrophic earthquake of 2010 that killed more than 315,000 people and affected the entire country. I was crushed. We immediately began working to help. We worked with the Clinton Foundation to help raise money for the recovery effort. And we partnered with Architects for Humanity and the American Institute of Architects to fund an architect in the country to assist in the short and long-term rebuilding. But I was aching to do more. So, together with HOK, Lend Lease and Adaptive Building Solutions, USGBC committed to building a LEED Platinum orphanage and children's center in the Del Mas neighborhood of Port au Prince. The Project Haiti: Orphanage & Children's Center will provide critical health and emotional services for Haitian orphans, and serve as a visible and replicable model of green, sustainable, resilient building practices. The project, which will be completed next year, will also offer nutrition services, healthcare including rehydration and vaccination services, counseling for parents including family planning services and a life-plan evaluation, education and skill development, and a comprehensive residential program. I've always said that the work we do in buildings is about people and about making their lives better. This building is my commitment to live up to that ideal. The Project Haiti commitment will provide a safe, comfortable and nurturing environment for dozens of children in Haiti that need it most. Still, we must do more. The world needs more commitments. Last week the Empire State Building received the LEED Gold certification from the U.S. Green Building Council. The award confirms what so many of us already know: This iconic skyscraper has become a model of energy efficiency and sustainability, and it is thanks to the dedication of its owner, Tony Malkin. Tony, the president of Malkin Holdings, is also a co-founder of NRDC's Center for Market Innovation and the husband of long-time NRDC Trustee Shelly Malkin. Tony has been a pioneer in bringing efficiency solutions to commercial real estate, and the US Green Building Council will recognize his transformative role when it gives him its 2011 Leadership Award in Toronto next month. Tony has been deeply committed to turning the Empire State Building's great gray tower into a green energy beacon. Mastering the retrofit is a critical endeavor, because even while new eco-friendly office buildings appear in skylines across the nation, the vast majority of commercial spaces were constructed before this trend began. In order to realize the full potential of America's energy savings, we have to transform existing buildings. Tony has given us a powerful example of how to achieve that. He took a an 80-year-old building, constructed in the Great Depression and draped in Art-Deco concrete—not the sleek steel and glass of new green buildings—and gave it a cutting-edge, cost-effective, energy efficient retrofit. The changes to the building will cut its energy consumption by more than 38 percent and save $4.4 million in annual energy costs. They will also reduce the building's carbon emissions by 105,000 metric tons over 15 years. Meanwhile, they will get a return on their investment in just three years. 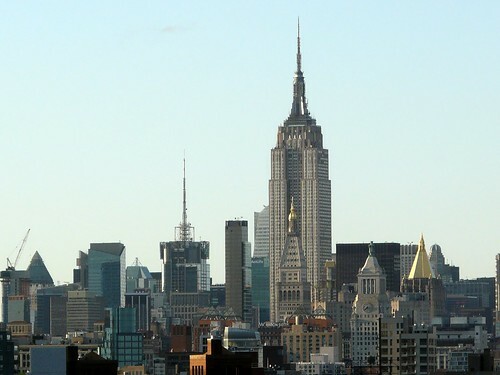 Throughout the retrofitting process, Tony has been committed to making the lessons learned at the Empire State Building non-proprietary and open-source so they can be applied to other projects. He has also played a critical role in NRDC's Center for Market Innovation's new efficiency retrofit demonstration initiative that was just unveiled at the Clinton Global Initiative in New York this week. Together with a team of industry leaders, including Goldman Sachs, Johnson Controls, Jones Lange LaSalle, Vornado Realty Trust, and the Greenprint Foundation, we launched this project to accelerate the growth of efficiency retrofit market. We are targeting commercial tenants who are already moving from one office space to another and encouraging them to include energy efficiency retrofits as part of the remodeling they would be doing anyway. Our goal here is to deliver efficiency installations and potential financing solutions that will serve the interests of both tenants and building owners. Tony has given invaluable guidance as we designed this demonstration project with our partners, and one of our earliest case studies took place in the Empire State Building with tenants Skanska. Now we are working with LinkedIn, another Empire State Building tenant, and Bloomberg. We look forward to seeing these demonstrations—and Tony's example—inspire other businesses across the nation. In January 2010, a devastating earthquake shattered the island country of Haiti. One of the countless destroyed buildings was that of Fondation Enfant Jesus, a non-profit, non-denominational orphanage and children's center that cares for more than 250 children per year. A few months ago, the U.S. Green Building Council invited HOK to join a partnership to design a replacement facility on the same site. The project is now a Clinton Global Initiative commitment, an honor that will help provide support for this effort. The redesign effort began at Greenbuild 2010, where a 35-person charrette generated ideas and preliminary drawings for the super-sustainable project. Now, as Greenbuild 2011 approaches, a dedicated, all-volunteer team of HOK architects, engineers and designers is working to create the pro bono design that will come to life on the currently condemned site on Port au Prince's Rue Fernand de Baudiere. The challenge goes far beyond a small site requiring a multitude of uses. Haiti's fractured (and, in some ways, nonexistent) infrastructure presents obstacles for providing basic needs such as electricity and running water. Environmental and cultural circumstances influence many aspects of the design, creating a steep learning curve for the team. Paramount among the challenges is that the building is to be LEED certified. The project will serve as a sustainable showcase for local architecture and construction professionals, hopefully influencing the future of sustainable design in Haiti. HOK's role in the process began with a weekend design charrette in June. Since then, the team has worked nights and weekends to develop a design. They have researched everything from potable water options to how the nation's Voudou heritage impacts culturally acceptable design and construction methods. The project team is currently working on the schematic design phase of the process. Stay tuned as we bring you the stories behind the evolution of Project Haiti – the team members, the designs, the charrettes and even an emotional visit to the site in Port au Prince. USGBC expects to complete construction by March 2013. Click here to visit the Project Haiti homepage to learn more about the project and donate to the effort. Celebrating this crop of industry trailblazers at Greenbuild has become an annual USGBC tradition. Join us at the Greenbuild Leadership Awards Luncheon on Oct. 6 as we rally around the successes of the green building movement by honoring these leaders. As longtime users of LEED, Wells Fargo is a participant in the newly launched LEED Volume Program for Operations and Maintenance, committing to pursuing high-performance for banking and office locations across its portfolio. Through his real estate business, Malkin has been a leader in existing building energy efficiency retrofits, including the $550 million makeover given to the “world’s most famous office building – the Empire State Building. The 80 year old building just announced that it earned LEED Gold, making it green building icon. CEQ’s organizational leadership, spearheaded by its Chair, Nancy Sutley, has moved President Obama’s green jobs agenda forward, by pushing for strong investments in high performing green buildings and schools that will help create jobs, build resilience, advance sustainability and stimulate long-term growth. Read Rick Fedrizzi’s take on Obama’s American Jobs Act. Bloomberg catapulted the “Big Apple” into a beacon for the green building movement, making it safer, stronger and greener. As chair of the C40 Cities Climate Leadership Group, Bloomberg made it possible for the largest cities around the world to adopt and implement similar, innovative sustainability policies. Bloomberg will take to the stage at the Closing Plenary at Greenbuild on Oct. 7, where he’ll also be honored for his leadership. Take a virtual tour of the first LEED Platinum hospital in the world, and learn how the Dell Children’s Medical Center of Central Texas (DCHCT) is making a difference every day in the lives of the children its serves. Kelly Caffarelli’s leadership enabled USGBC to fully engage the affordable housing community in the development of LEED for Homes. Her leadership has paid off, as nearly 50% of LEED-certified housing units are affordable. With a company-wide goal of carbon neutrality by 2013, Deutsche Bank has worked to reduce its corporate footprint while providing the tools and resources to help others do the same, through investing in alternative energies and low-carbon technologies. This past year, the company earned LEED Platinum for its own headquarters in Frankfurt, Germany, which is designed to reduce water consumption and CO2 emissions by 74% and 89% respectively. President’s Award: Greg Kats, Capital E, Good Energies; and Lynn N. Simon, FAIA, LEED AP Simon & Associates, Inc.
Jayni Chase, Chair of Green Community Schools, a program of the MGR Foundation, was honored as the first recipient of the Center for Green Schools Excellence award for her work as a pioneer in transforming schools into sustainable places to learn, work and play. Jayni is one of the original leaders of the green schools movement, and serves as a valued member of the Center for Green Schools’ Advisory Board. She has been a true champion in making green schools a reality for the millions of Americans who go to school every day. Do you have an idea for the next big innovation in green building? If you submit a video that tells your story in one minute or less, you could find it on display at the world’s largest green building expo. In 1891, Clarence Kemp, a Baltimore-based entrepreneur that sold home heating equipment, came up with the idea of attaching a black box with water in it to the roof of people’s homes. He had invented the first passive solar water heater, an innovation that continues to play an important role in residential design today. So what’s next? Who will be the next Clarence Kemp? USGBC is teaming up with Planet Forward to host the “What’s Next?” competition. The winning videos will be featured at Greenbuild 2011, the world’s largest green building expo, which runs from October 4-7 in Toronto. Upload your video to YouTube or Vimeo and tag it with the keyword GBNEXT. E-mail us a link to your video at GBNEXT@GreenbuildExpo.org. If you have a Twitter handle, include it in your e-mail so we can give you credit when we tweet your submission! Use hashtag #GBNEXT to share your video on Twitter, and join the conversation on what’s NEXT for green building and our planet’s success. Submissions must be received by Sept. 28, 2011. Need inspiration? Watch videos on Planet Forward to get your creativity flowing. Here’s one on Energy Efficient Home Landscapes, and here’s one on Greensburg, Kansas, who used green building techniques to rebuild their town after it was devastated by a tornado. Want some advice from the experts? Planet Forward provides tips on how to make a great video. While many in the green schools movement have been focusing on President Obama’s “American Jobs Act” that would allocate $25 billion for school modernization, Tuesday brought a vote on the floor of the House of Representatives to improve the resource efficiency of America’s charters schools. As part of the debate on H.R. 2118: Empowering Parents through Quality Charter Schools Act, which reauthorizes and modifies federal charter programs, Congressman Rush Holt of New Jersey offered a common sense amendment, to give priority to facility grant recipients that utilize green building rating systems and certifications. Congressman Holt’s amendment received the support of a bipartisan group of legislators from all across the country but did not have the votes needed to be adopted. To see how your member of Congress voted click here. It can be discouraging that some members of Congress are still not translating the benefits of reduced operating expenses, enhanced learning environments and increased accountability of taxpayers’ dollars that green schools offer. However it is encouraging that some members continue to work in a bipartisan fashion to solve problems. The effort by Congressman Holt and others is only one bite of the apple, in the effort to improve charter schools programs as the Senate has yet to consider these programs. Are you headed to Toronto and eager to take in all of the sights and sounds the city has to offer? You’re in luck— Greenbuild is packed with opportunities to experience the architectural, political and financial capital of Canada, while learning about its long legacy of green building leadership and innovation through on and off-site educational sessions, speakers, tours and walking the exhibit hall floor. Take a tour inside the inner workings of Toronto’s greenest buildings. Tour a green art gallery, green roof, or a green office. Indulge in the area’s best restaurants and cafes (Peameal bacon sandwich, anyone?) Greenbuild is chock full of opportunities to think outside of the convention center. Once you’ve explored everything within city limits, head back to the Metro Toronto Convention Centre, and learn about Canada’s green legacy and plans for the future in the home of the Toronto Maple Leafs, beginning with an address by former Canadian Prime Minister Kim Campbell at Wednesday night’s opening plenary, one of the many highlights of the evening Opening Keynote & Celebration. Be sure to take advantage of the shoe check-in located on Level 600, South Building and Level 100, North Building, where we’ll watch your walking shoes while you network in your loafers or heels at the conference. Set your Greenbuild Scheduler to catch one of seven “Best of Canada” education sessions taking place throughout the show and convening the country’s green building and business leaders to discuss everything from local green building codes to the greening of Toronto’s central business district. Then walk the Greenbuild show floor to learn about innovative products and services from over 150 Canadian exhibitors. Don’t forget to learn about the two Greenbuild Legacy projects that explore and celebrate teaching children about healthy, sustainable, urban food—the Chimney Court Children’s Greenhouse and the Gateway Gardens Project, both located in Toronto. And once you’ve walked, biked, bused and subwayed through the very pedestrian-friendly city, take a tip from Treehugger contributor and Torontonian, Lloyd Alter, who’s begun a laundry list of local favorites and things to look for in his series, “Building Up To Greenbuild” for more itinerary ideas. As October draws near and final preparations are underway, I wish to speak on behalf of the CaGBC to express our pride in hosting Greenbuild 2011. It’s actually quite fitting that the first Greenbuild outside of the United States be held in Canada because it demonstrates the close partnership between the USGBC and CaGBC that has been built over many years of advancing LEED and green building in North America. The success of our cooperative relationship is evidenced by the approximately 500 million square feet of LEED projects that are registered or have been certified in Canada since 2004. Greenbuild will be a wonderful opportunity for delegates from all over the globe to see why Canada is a green building world leader. Some of the greenest projects in the world are in Canada including Dockside Green in Victoria and the 2010 Winter Olympic venues and villages in Vancouver. Toronto is the leader in green office construction and renovation. The Royal Trust Tower, the RBC Centre and the Telus House Toronto are among the greenest office buildings in North America. These LEED projects are leading the market transformation and tenant demand for green office space in Toronto and elsewhere in Canada. As well as being a world-class centre for entertainment, business and culture, Toronto has shown strong leadership and private and public sector commitment to green building. Policies such as the Toronto Green Roof Policy, Toronto Waterfront Revitalization Corporation, Infrastructure Ontario’s LEED policies and TRCA’s Living City Campus are leading pieces of green building regulation and demonstration projects in North America. Large developers such as Tridel and Minto and landlords including Cadillac Fairview, Oxford Properties, and Brookfield all have significant green building portfolios in the city. But there is no doubt that Greenbuild will be a game changer for Toronto and for Canada by taking green building to the next level in terms of industry and government recognition and international trade. The conference demonstrates that green building is an industry sector of the future, bridging the gap between business and the environment, providing significant opportunities to reduce environmental impacts, improving the health of Canadians, furthering economic growth and increasingly providing international trade opportunities between Canada and the US. While at Greenbuild, make sure you visit us at Canada House to better understand the growing and increasingly sophisticated green building industry in Canada; a rich market for new services, products and technologies that continue to evolve and shape the new green economy. USGBC has thrown its support behind the latest legislation effort to revive Property Assessed Clean Energy, or PACE. H.R. 2599, the PACE Assessment Protection Act of 2011, introduced by Rep. Nan Hayworth (R-NY) and Rep. Mike Thompson (D-CA), directs the Federal entities responsible for mortgage lending to adopt underwriting standards that are consistent with the PACE guidelines issued by DOE. This bill would also ensure that no Federal agency can discriminate against communities implementing or participating in a PACE program, offering critical protection and security to home owners, businesses, and local governments. The bill currently has support in the House of Representatives with more than 20 bi-partisan co-sponsors. It also has the endorsements of numerous companies such as Dow Chemical and municipal organizations like ICLEI – Local Governments for Sustainability USA. For those familiar with the history of PACE, more than 22 states and the District of Columbia embraced the widespread benefits of job creation, utility savings for home and business owners, and increased clean energy and energy efficiency, but due to federal restrictions issued by the Federal Housing Finance Agency (FHFA) last year, PACE programs around the country have largely been halted. USGBC has a track record of supporting PACE programs. Last year more than 350 member organizations of USGBC supported legislative action to undo the regulation of FHFA. Now it's up to Congress to act to reinvigorate these programs. On Wednesday there was a good sign coming out of the Senate Appropriations Committee for the continued efforts to restart the Commercial Building Energy Consumption Survey (CBECS), the national survey that gathers statistical energy information on U.S. commercial buildings at the Energy Information Administration (EIA). As part of H.R. 2354, the fiscal year 2012 Energy and Water Development Appropriations, as reported by the Senate Appropriations Committee, will provide $105 million for EIA. This is a funding increase of approximately $10 million from 2011. The Committee also provided guidance to EIA recommending that work on a new CBECS survey beginning in 2012. As some know, CBECS is widely important for those in the real estate and building community and is the data backbone of important programs such as LEED for Existing Buildings and ENERGY STAR. The survey had encountered a perfect storm of problems over the last six months. As part of this year’s budget reductions passed by congress, EIA's funding was cut by 14 percent, forcing EIA to suspend its work on CBECS for 2011. This came on the heels of EIA not releasing the 2007 survey because of design and survey flaws. USBGC along with more than 70 groups sent a letter to the Senate and House Appropriations Committees urging that Congress restore funding for the Commercial Building Energy Consumption Survey (CBECS). The letter was coordinated by USGBC, the Natural Resources Defense Council (NRDC), the Real Estate Roundtable (RER) and members of the Real Estate Network for Energy and Climate Policy (RENECP), a network that supports comprehensive clean energy and climate policies that advance building and location efficiency. These are all good signs as USGBC and other community stakeholders continue to work with the Congress and EIA to begin CBECS again in 2012. 1 Does not include rescission of $86,300,000 under Public Law 112–10. The Committee recommends $105,000,000 for the Energy Information Administration. The Committee notes that the Energy Information Administration has announced that it will not release the 2007 Commercial Buildings Energy Consumption Survey (CBECS) due to data and sample flaws resulting from the survey method employed. The 2003 CBECS remains the most current survey of commercial building efficiency used as the baseline for The Energy Star program at U.S. EPA, the U.S. Green Building Council's Leadership in Energy and Environmental Design (LEED) program, and others. In light of the age of the 2003 survey and the failure of the 2007 study, the Committee recommends that the Energy Information Administration complete a new Commercial Buildings Energy Consumption Survey during fiscal year 2012. I found myself sitting at the kitchen table last night, long after the President and the Packers were done. The Packers won. What was keeping me up was the thought that the country might actually be able to pull our own victory out of what has been increasingly feeling like an end-of-the-fourth-quarter goal-line stand. Clearly the President was channeling Knute Rockne, Joe Paterno, Bear Bryant and every other great coach out there. Focus on the fundamentals. Block, tackle and don’t get distracted. Want it more than anything you’ve ever wanted in your life. That’s how you win. Despite all the technology enablers that we’ve dreamed up, and all the fantastic advances in materials science and the awe-inspiring design innovations that have been conceived, what we do in our industry is as straightforward and as people-centric as it gets: Our industry puts shovels in people’s hands and foundations get poured. It puts wrenches in people’s hands and steel rises. It puts hammers in people’s hands and homes get built. It puts the controls of massive bulldozers in people’s hands and roads and bridges get shored up. Building is a noble act and building sustainably is an act of nation-building that in 10 short years has created a $60 billion industry that never existed before. Our hard-won environmental efforts have spawned jobs and unleashed innovation, and unlocking the massive fuel source of energy efficiency creates jobs that can’t be exported. Nowhere is that more important than in our homes, our neighborhoods and our schools. In fact, our schools have long been ringing the alarm, and there are thousands of projects out there that are ready to go the minute the funding is available. On average, our schools are more than 40 years old. Nearly a quarter of them require extensive repair just to meet basic health and safety standards, and 15,000 schools have air that had been deemed unfit to breathe. Our kids deserve school buildings that enhance their learning and their health, not compromise it, and this is a way to deliver on that promise. Our workplaces are no less in need of improvement. The green building industry has suggested a fix to an existing tax incentive, Section 179D, that would put 77,000 people to work improving offices, malls, and supermarkets immediately. There is no downside for the Administration or any member of Congress to picking up this suggestion and running with it. It’s baffled me that we let ourselves get to this fourth and inches situation on the jobs front. But we’re here. So I say, let’s get on with it. It’s time we won one for the American people. Tonight President Obama will address the nation to outline a jobs plan, propose a robust infrastructure initiative, restore confidence in a fragile economy and ensure our continued leadership in the new global economy. We need a plan for immediate and long-term employment. We need a strategy to reinvigorate the economy and make America a safer place. We need to build a resilient nation. Advancing a resiliency agenda, a post-partisan plan will help us meet the challenges of today and tomorrow. While over the years our politics has sharpened, seeming more stinging and acidic, our leaders from both parties and those of all political ideologies in America are uniformly guided by a primary principle – strive for greater prosperity and security for the citizens of this country. Those two hallowed objectives – prosperity and security – are inextricably linked. And a strong and sustainable America is a prosperous America. But we’re facing a silent onslaught at home that is jeopardizing that future. Our brittle infrastructure is crumbling below our feet and all around us. Our roads and bridges and buildings – the bones of our economy – are in dire need of attention. It is imperative that we avoid a cascading effect where one system’s breakdown leads to another system’s collapse. In 2005, the U.S. was ranked first in infrastructure, according to a World Economic Forum report. In a reprisal of the report released this week, the U.S. has dropped to 24th. Take our schools for example. Sadly, the American Society of Civil Engineers (ASCE) gives the state of our public school facility infrastructure a shameful “D” rating, calling for tens of billions of dollars in urgent investment. If education is the foundation, we’re chipping away at this precious bedrock of American leadership and success. The average school in America is more than 40 years old. A fifth of our schools, roughly 25,000 school buildings, require $112 billion in extensive repairs and renovations just to bring them up to minimum standards. And more than 15,000 schools have air that has been deemed unsafe to breathe. ACSE, further diagnosing our severe osteoporosis, grades our “infrastructure GPA” (which covers other categories like roads, bridges, levees, transit, and drinking water) a “D,” saying we need a $2.2 trillion five-year investment. Resiliency adds calcium to the bones. It would make us stronger, reignite our ability to lead and innovate, and ultimately power our productivity. That’s why, among other clean energy policy proposals we may hear about tonight, one of the most important is an Infrastructure Bank that builds resilience, advances sustainability and stimulates long-term investment opportunities. We can put Americans back to work by focusing on nation-building at home and strengthening the very sinews of our country. There are more than 2 million jobless construction workers. An infrastructure bank would put these people back to work to build and rebuild our roads, bridges, buildings, dams, levees and transit – better, stronger, greener. And a strong infrastructure is the backbone of a resilient nation and a sustainable future. Tonight, as President Obama stands before Congress and the American people to call for action to spur job creation, many of us will be at the Newseum for the Nine Eleven Tenth Anniversary Summit. The theme is Remembrance, Renewal, Resilience. We will remember those family and friends who lost their lives. We will honor the survivors and heroes who responded and carried on to rebuild America. And together with leading organizations such as the Center for National Policy and the Community and Regional Resilience Institute, we will launch of a National Resilience Campaign that calls on individuals, communities, and companies to become more involved in a national effort to build a more resilient America. One day the history books could say that the Obama Administration’s stimulus package of 2009 saved the nation from deep and irreparable financial collapse. But one thing we know right now is that the historic $90 billion investment in clean energy was a significant policy decision for unleashing critical market forces and helping ignite a nascent clean energy economy—a decision that continues to pay clear dividends. Clean energy technology was identified by the Center for American Progress (CAP) as “one of the fastest-growing sectors of the global economy…projected to grow to $2.3 trillion by 2020.” For example, it is estimated that 827,000 clean energy jobs will have been saved or created nationwide by the fourth quarter of 2012 through the progressive provisions of the American Recovery and Reinvestment Act. Bracken Hendricks, author and senior fellow at CAP, called the green stimulus dollars the “the most important energy bill in American history.” And if we want to spur more new jobs that cannot be outsourced, we need even more innovative policy decisions that spur better clean energy market choices. That is why clean energy and a more intelligent and resilient infrastructure to deliver that energy are also key components of CAP’s three step approach to further boost job creation: 1) Invest in national infrastructure through existing channels and the creation of an investment bank; 2) Stabilize the housing market through restructuring loans and automatic foreclosure mediation; and 3) Promote residential and commercial energy efficient retrofits. Today, the Bureau of Labor Statistics reported that unemployment in the United States has remained unchanged at 9.1%, and that no new jobs have been added to the U.S. economy. Retrofitting our buildings may be the most obvious step forward when buildings consume 70% of all electricity and contribute to 40% of our national greenhouse gas emissions. McKinsey & Co showed that we could create nearly a million jobs by working to bring building energy retrofits to scale. With 25% unemployment in the construction sector, energy efficiency retrofits make our investment dollars go further by creating jobs, saving homeowners and building occupiers utility expenses and reducing our nation’s impact on the environment—called a triple win by some lawmakers. In a few days the President will address the nation on the current state of unemployment and the economy. We anticipate and hope that his speech will include provisions for ramping up investments in clean energy and conservation. The clean energy economy could be the silver bullet needed to ensure America’s sustainable future—not exclusively in the environmental sense, but as a self-perpetuating and long-term economic solution. Greenbuild Green Jobs Summit: The U.S. Green Building Council, in partnership with the Center for American Progress, the BlueGreen Alliance and the BlueGreen Alliance Canada, will host the Green Jobs Summit at Greenbuild 2011 to further explore the role of green jobs in the economy as well as their deployment. The Summit will feature notable experts and sector leaders inlcuding eco-entrepreneuer Majora Carter and Dan Esty, Commissioner of the Department of Energy and Environmental Protection for the State of Connecticut.